If you can call decks this young “vintage,” that is. It has only been about five years since they were first released. That was around the time I was discovering trading card games. Bolas was THE BEAST back then, and he recieved a reprint in M13 when I began playing in tournaments, and I would see him on my opponents side of the table, and be envious. Good times! Ajani vs. Nicol Bolas comes in this foil box. We get some information about this story…clearly Ajani is outmatched…but at least you can play him on turn four. Bolas is an EIGHT DROP. Bolas destroyed a plane called Alara, and Ajani is mad. That summarizes it. For this review, I hope to show some of the older elements that I find. Here is what you get in the box. The deck boxes are pretty, but once again useless for sleeved cards. This time I am going to cut these up and glue them to Dragon Shields boxes…Ivory for Ajani, and Maroon for Bolas. The artwork here … we see Bolas from a different angle in this art. We see what might be the size difference between the two characters. Here is the deck list for each deck. Here’s one of those old elements I was talking about…the guide to playing magic! This poster gives you a lot of information. 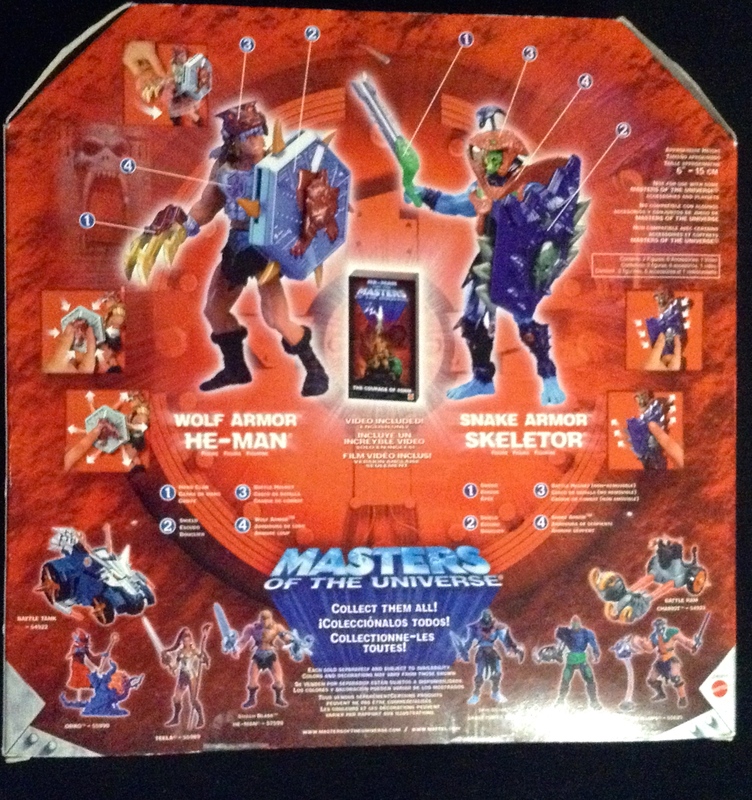 In fact, I believe when me and the SpartanChildren began to play this game, we kept this same item on hand for reference. Nowadays the wizards just use a tiny little card that doesn’t explain much. OK ALREADY. LETS UNWRAP SOME CARDS! Kird Ape. The poster boy for red-green decks. I was surprised to see green cards…I guess Ajani held is battle on the shard of Naya. Wild Nacatl, a posterboy for Naya (red-green-white.) Wild Nacatl has a legacy of being banned in modern, but recently was taken off of the banlist. We’ve seen the pridemate printed a few times it seems. Qasali Pridemage has been printed a few times as well. He is good…with exalted and a control ability. Lightning Helix…now we’re talking! a great card. Here we have useful to rediculous cards. Naya Charm…if it’s a charm, it’s good. Titanic Ultimatum…the opposite of Cruel Ultimatun…a spell of rediculous power, that demands intense color loyalty. Ajani goes after Bolas with lots of different land options. Notice “Evolving Wilds…” The Jungle Shrine is a Tri-Land, one that I didn’t have. Sapseep Forest…is a FOREST. You can tutor for it with a real fetch. (Not with evolving wilds.) I belive I had Vitu-Ghazi, the City Tree already. Ajani’s deck is a dedicated aggro deck with a few tricks. It yells the colors of Naya. And it does what those colors do. The green makes bigger creatures. The white gains life. The red does damage. All of Ajani’s stuff can impact the game in a big way. I never owned a Moroii before. Apparently an infamous flyer that hurts you each turn. He has a drawback for all the power he has to offer, similar to the demons in the duel deck with Lord of the Pit. Shriekmaw…this guy belongs in every casual black deck. Blazing Specter unsurpsingly makes someone discard a card. The specter family of cards typically do something with cards in hand. Vapor Snag. NICE. I have a foil from Modern Masters, and I think I will make my first swap. More control. Countersquall. Recoil. Undermine. Icy Manipulator. 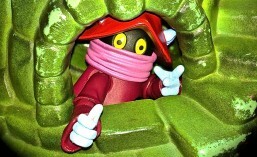 (The manipulator has brought me a few win!) Just more control. And even more control. Profane Command could only be supplanted by Similagar’s command, which wouldn’t be printed for another five years. Come on guys. Why not Cryptic Command? 🙂 Turn/Burn, Pain/Suffering. Bolas has to cheat. So why not draw two different cards when he was only supposed to draw one! 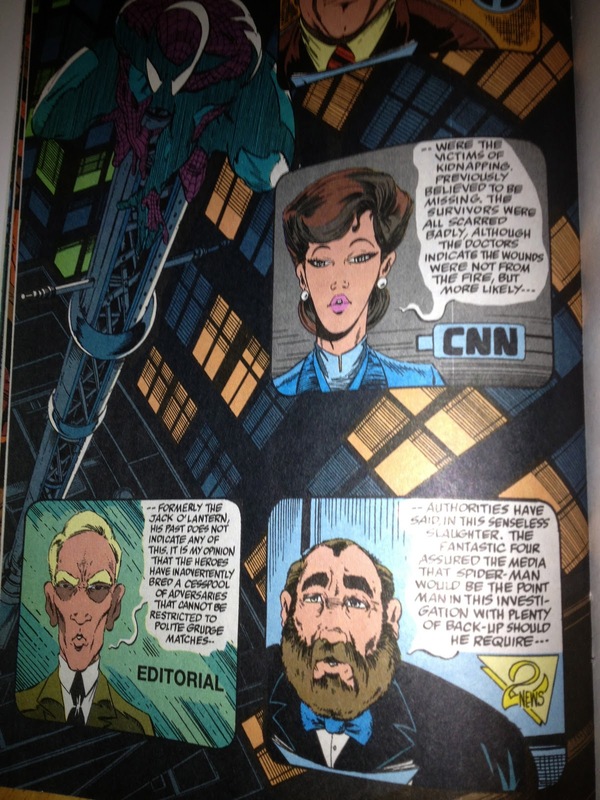 And then the imfamous Cruel Ultimatum. Wow. The card that won MTG pro finals back in 2011. But like the other Ultimatum in this collection, it is color intensive. You have to have everything lined up just right to get it to work. Cruel is better than Titanic because Titanic is meant to be announced before attackers are declared. Your window of opportunity is wider with Cruel Ultimatum. Take away their life irregardless of blockers. Make them ditch cards, and get one of Bolas’ few but great creatures back from the graveyard. I say, Bolas’ deck has a better plan. Deal with whatever Ajani throws at him. That’s what makes this deck fun. But Ajani can “run over” Bolas before he can win. And that means these two are perfectly balanced. So far, I have played eight matches between the two, and both have four wins. GREAT WORK, WIZARDS (Five years later.) The decks are fun. Just remember, AGGRO for Ajani. CONTROL for Bolas. Have small fast creatures in your opeing hand with Ajani. Have fast removal and card draw in Bolas CONTROL deck. DID THE SPARTANNERD GET A GOOD DEAL. Here is what some of my readers is asking. The Duel Deck version of Ajani and of Bolas, in premium foil, are about a $6 value. Wild Nacatl and Kird Ape get you about $4 (together). Lightning Helix will get you about $6.00. Basically, I got a $70 value for about about $45. Not bad! I rate this great product 5/5. It has wonderful flavor, and I got a great deal. I will happily add this to my Duel Decks collection! 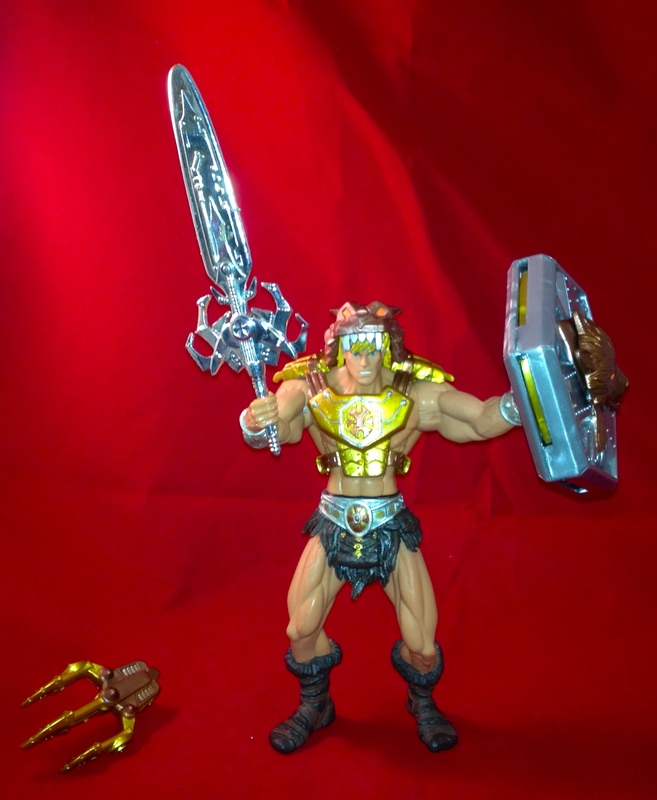 SpartanNerd, you wanted a MOTUC Two-Bad. Well. Too bad! So I will settle for the next best thing. 200x Two-Bad. IMHO, the vintage 1980’s Two-Bad was not very good. I remember making him punch the opposite face all the time. And that’s about it. He couldn’t stand very well, because he was top heavy. He couldn’t hold weapons because his hands were permanent fists. 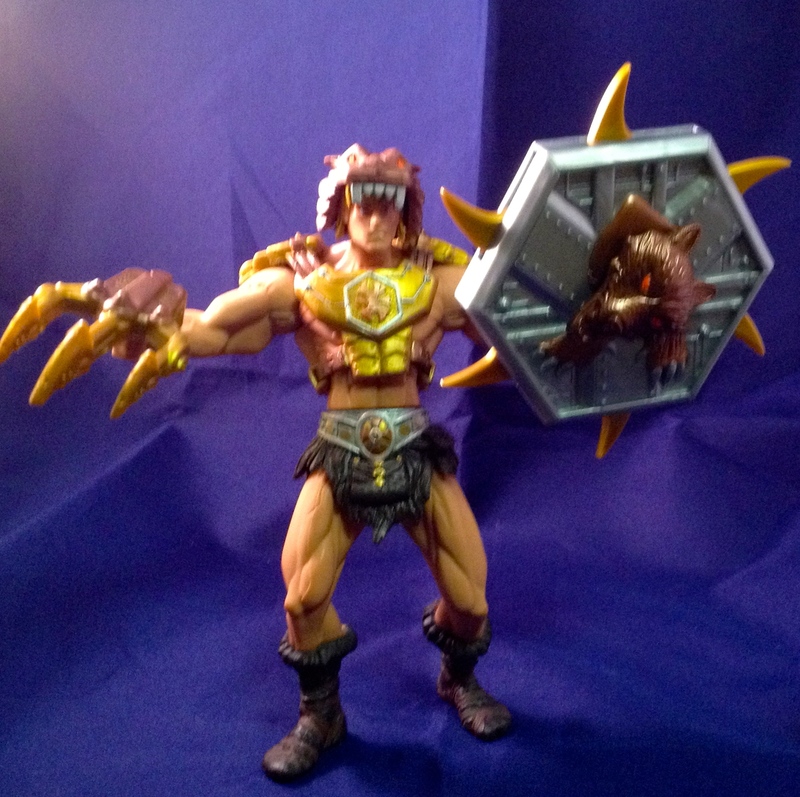 And his shield didn’t fit on his arms correctly. 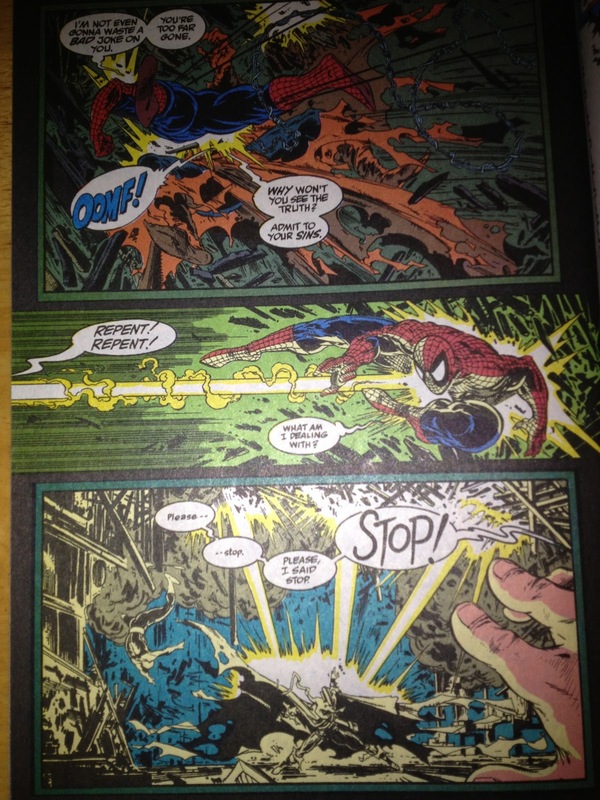 I did enjoy the power of punching with the spiny loaded arms and waist feature combined, however. This was the strongest action feature in the original figures. 200x Two-Bad doesn’t have any of those problems, and the action feature is also pretty cool. So he is an advance in every way! 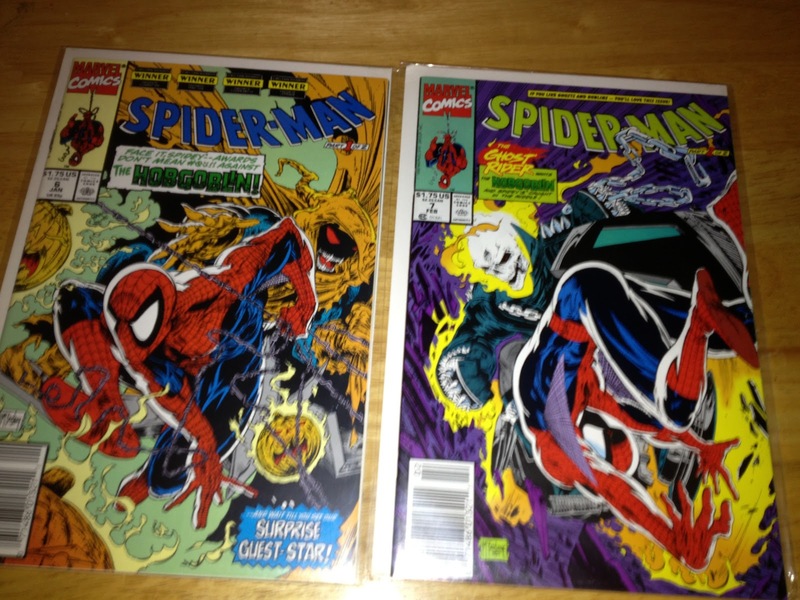 Here is Two-Bad in his original packaging. Notice the price tag. The dude at the Barnyard Fleamarket shaved a little off. 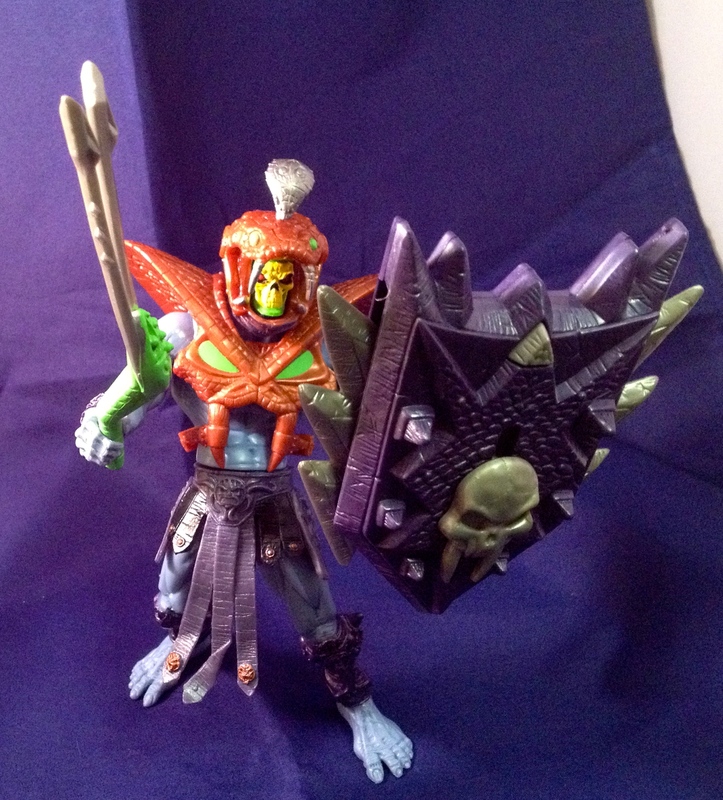 This back is different from Beast Man and He-Man. We get a nice large pic of the figure. It still has the annoying foreign languages all over the package. They should have made a different card for the foreign languages, and gave people something else to collect, rather than this all-inclusive strategy. I like the white outline around the figure. I took this pic when I removed him from the packaging. Impressive! sporting a hinge between the two pieces. No big button behind this figure. His arms are spring loaded themselves. 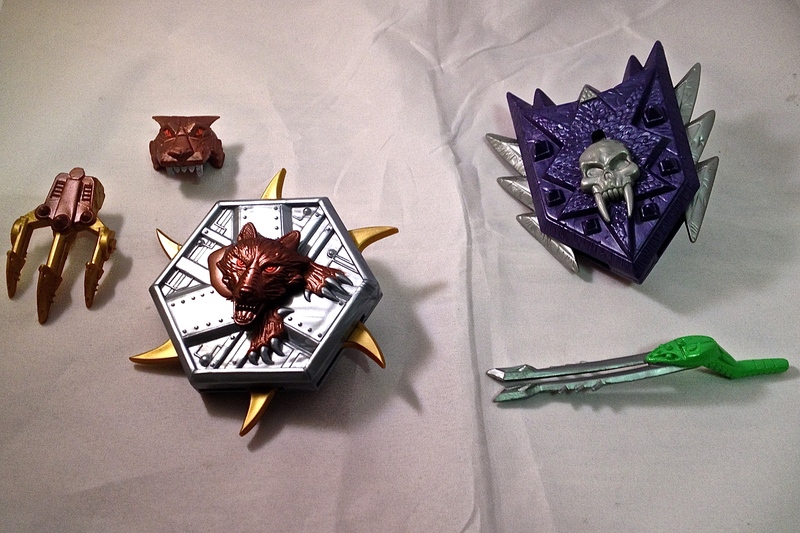 Notice that the Baddra side of Two-Bad is the exact same color as Spikor! 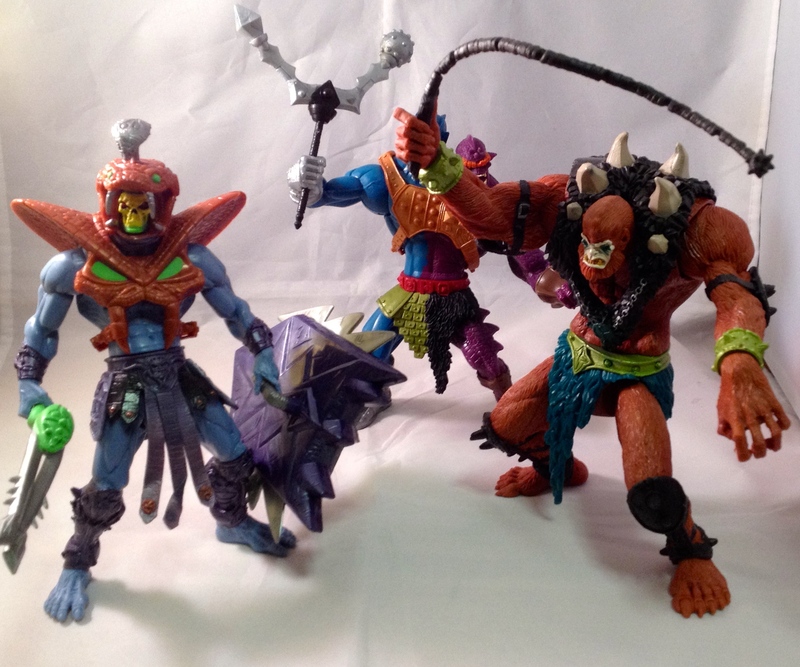 In this pic you can see that Two-Bad is noticeably shorter than the MOTUC figures. 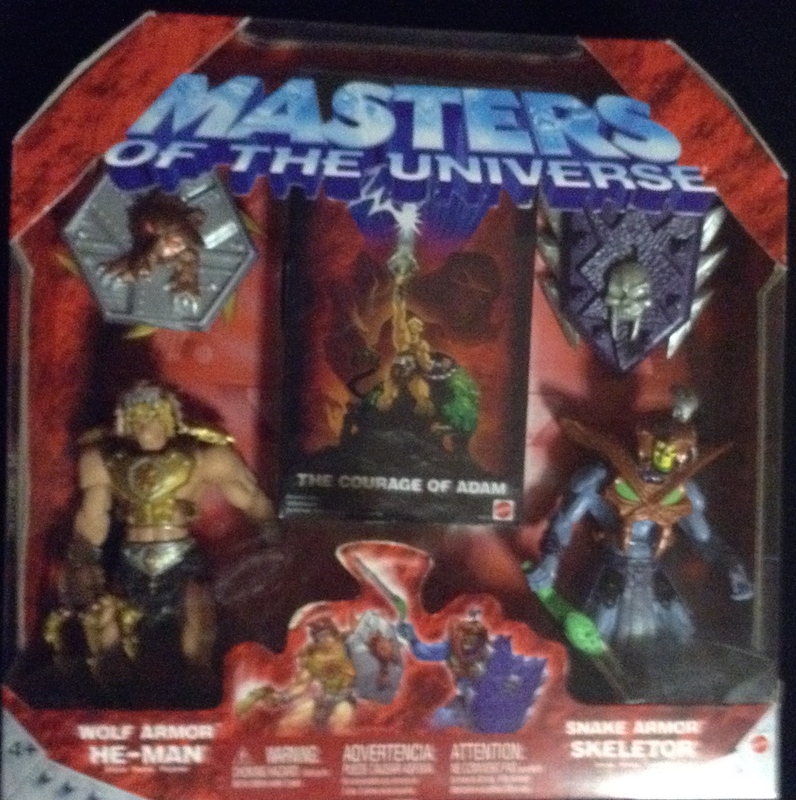 😦 Also, both heads seem a tad smaller than He-Man and Beast Man’s heads. Here is a shot of all of my baddies together. The best thing about Two Bad is he helps fill my ranks a bit! So, what is my rating of Two-Bad? I like that he is an improvement on the 1980’s figure in every way. His arms are way better. The Horsemen sculpted him, and he is very detailed. He has excellent weapons. He stands nicely. The only point was taken off because of his slightly off scale build, which was probably done to save money on a fig that was fully tooled. I rate 200x Two-Bad 4/5. Do you agree? Let me know! 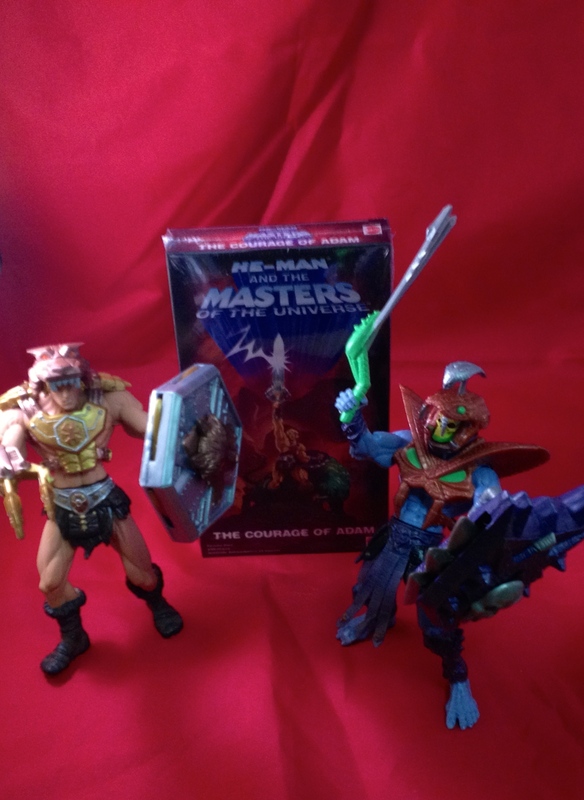 Posted in Baddra, Beast Man, He-Man, Masters of the Universe Classics, review, Skeletor, Spikor, Tuvarr, Two-Bad, unboxing, Vintage, Vintage Alert!.